Using randomised controlled trials to evaluate public service delivery: how best to attract families to Sure Start? Sarah Cotterill, University of Manchester, Peter John, University College London and Alice Moseley, University of Exeter, discuss their article, ‘Does mobilisation increase family engagement with an early childhood intervention programme? 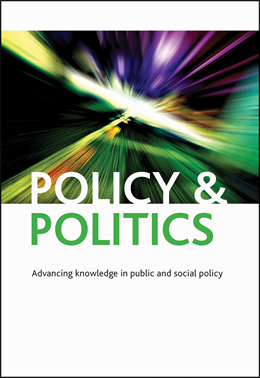 A randomised controlled trial’ which was published in Policy & Politics in 2013, and is available free during April 2014. Sure Start services are popular with families in the UK, but not all families who might benefit choose to attend. Two methods which are commonly used to promote Sure Start are leaflets and door-to-door visits. Both methods are known to be effective in other contexts, such as mobilizing citizens to vote or encouraging them to recycle, but, prior to our study, there was no evidence of their effectiveness in promoting attendance at local services. Working in partnership with a local authority provider of Sure Start services, we set out to test whether a leaflet about Sure Start or a door-to-door visit from an outreach worker are persuasive methods of attracting families to attend Sure Start centres. We used a randomised controlled trial (RCT), which is fairly novel in research on public services, yet has the potential to provide a convincing estimate of the effect of policy interventions. Using the register of births, we identified children born in the previous eighteen months, whose families had not yet attended Sure Start. We randomly assigned families to one of three conditions: a leaflet about Sure Start, a visit from an outreach worker, or a control group that received no special treatment. Over several weeks we measured the outcome, by recording whether or not the families attended their local Sure Start centre. We compared attendance by families in the three groups to see whether attendance differed across the different interventions. The advantage of random assignment is that membership of the treatment and control groups are very similar in all respects. Therefore, any differences in observed outcomes between the groups can reasonably be attributed to the intervention rather than any other cause. We found that the brief doorstep visits and leaflets implemented in this study were not a worthwhile way of promoting Sure Start to families who are not already engaged: although we cannot rule out a small effect, the results of the visits and leaflets were not significantly different from the effect of the usual service. We believe that RCTs could usefully be employed much more extensively in the evaluation of public services. Find out more from our book, Nudge, Nudge, Think, Think: Using Experiments to Change Civic Behaviour, in which we describe the RCT method and offer examples of its use in testing various interventions to promote civic behaviour such as recycling, charitable giving and organ donation. ‘Does mobilisation increase family engagement with an early childhood intervention programme? A randomised controlled trial’ is available free on Ingenta during April 2014.